​Fred VanVleet capped a late Toronto rally with a three-pointer with 25.9 seconds left and the Raptors snapped a two-game slide by beating the Indiana Pacers 99-96 on Wednesday. Pascal Siakam summed up his confidence in teammate Fred VanVleet with two words: "Steady Freddie." VanVleet displayed his resiliency Wednesday, bouncing back from a dismal first three quarters to rally the Toronto Raptors to a 99-96 victory over the Indiana Pacers. VanVleet was 1-for-12 through the first 36 minutes before nailing a trio of three-pointers to ignite a furious Toronto rally in the fourth quarter. "Steady Freddie, man," Siakam said with a smile. "I don't care if he misses 99 per cent of the time, I'm going to still pass him the ball because I know he's going to make the important ones." What looked to be a Pacers rout — they led by as many as 17 points — turned into a close game in the fourth quarter with Toronto chipping away at a 10-point deficit. VanVleet capped his three-point barrage with one with 25.9 seconds left to give Toronto its first lead since the opening quarter. 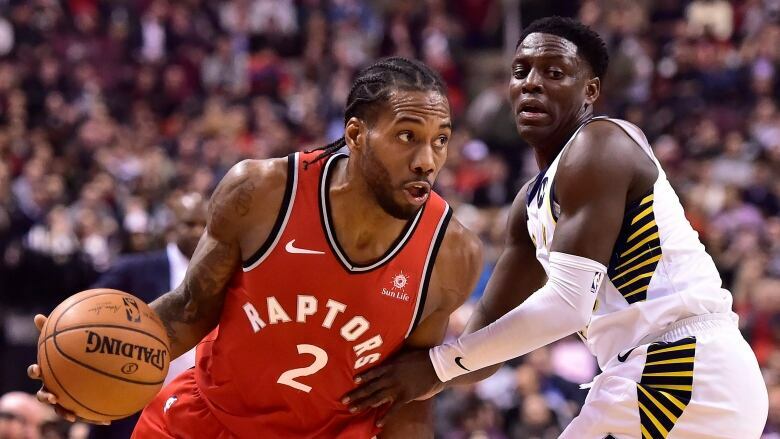 His first three ignited the sellout crowd at Scotiabank Arena, bringing the Raptors within seven points with eight minutes left, and his second followed an emphatic Kawhi Leonard dunk moments later to make it a two-point game at 90-88. "It takes a lot of energy to play that bad and then that good at the end," said VanVleet, who finished with 11 points. "It was a roller-coaster of emotions and energy and effort and those ones feel good, walking back to the locker-room knowing you probably stole one. "I thought the way we played the last 12 minutes we deserved to win but we really dug ourselves in a weird hole." Leonard had 28 points and 10 rebounds to lead the injury-riddled Raptors (24-9), who were playing without all-star point guard Kyle Lowry and big man Serge Ibaka. Pascal Siakam had 17 points and Greg Monroe added 13 as Toronto halted a string of back-to-back losses. WATCH | Is Kawhi to blame for Raptors losses? Victor Oladipo led Indiana (20-12) with 20 points and Myles Turner had a double-double with 10 points and 14 rebounds and Bojan Bogdanovic added 18 points. The Pacers were on short rest following a loss Tuesday night against Cleveland that snapped a season-high seven-game win streak. Indiana used a 9-0 run, punctuated by a three-pointer from Bogdanovic, to go up 74-58 halfway through the third quarter. Another Bogdanovic three extended Indiana's lead to 17 points at 77-60. "To be honest, I was really disappointed with how we were playing (in the first half)," said Raptors coach Nick Nurse. "We were just backing out of there, giving them the basket. ... But in the end we found a little groove and we finally started guarding and just told them to stay with it." Indiana led 34-24 after the first quarter and led 58-50 at the half. Toronto hit just three of their 18 three-point attempts over the first 24 minutes while Indiana went 5-for-10 from beyond the arc. "We did a good job of just sticking in there, keeping our heads up and pounding," Leonard said. The Raptors did get some good news on the injury front Wednesday with Norm Powell playing for the first time since hurting his shoulder on Nov. 5. Powell split his lip when he was knocked into by Domantas Sabonis in the first quarter but returned to the game in the second. "I didn't know how bad it was but I knew my lip was busted," Powell said. "I was just hoping [I] didn't need to come out of the game or have a concussion or need stitches, nobody needs that right now. But it wasn't as bad. I was glad to hurry up and get back out there." Montreal native Chris Boucher played 9:43 and had five points and two rebounds, including a three-pointer on his first shot of the game.